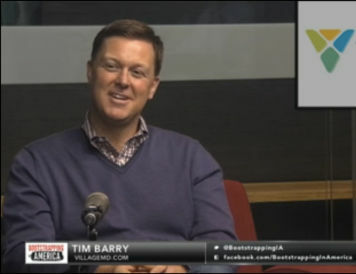 VillageMD CEO Tim Barry was interviewed on the Oct. 1, 2015 edition of the "Bootstrapping in America" podcast. Barry spoke with host Tom Sosnoff about VillageMD's business model, its goal for improving primary care and the company's rapid growth. "You have a phenomena where these [primary care] providers are doing everything they possibly can under increasing regulatory requirements, under decreasing reimbursement, they've been challenged to try to provide the level of health care that would be ideal for their patients," said Barry. The podcast "Bootstrapping in America," produced by the tastytrade financial network, regularly features discussions with rising entrepreneurs.